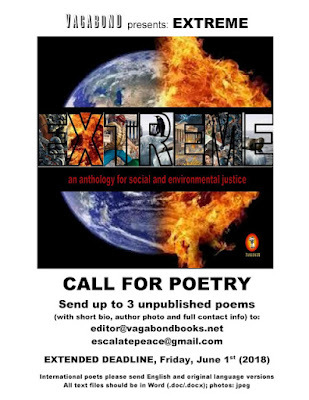 have been selected for our upcoming anthology, EXTREME (an anthology for social and environmental justice) to be published by VAGABOND. For your contribution you will receive a copy of the completed work upon publication. The production schedule, launch events and other anthology related matters are still in the process of completion. We will make sure to keep you informed about any important updates. If you would like to schedule a launch event in your city, please contact me about scheduling – thank you. If you have any changes or correction to the poem selected, please send those to me at your earliest convenience.